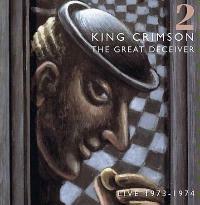 Here we have the second set of live Crimson tracks just reissued. See my review of Volume 1 for more information about this release overall. Suffice it to say that King Crimson live (particularly in this incarnation) was a major force to be reckoned with and the progressive rock world is surely blessed to have these recordings available. It just doesn’t get much better than King Crimson live. The grouping here is the classic Larks’ Tongues…/Starless and Bible Black/Red one, Robert Fripp, Bill Bruford, John Wetton and David Cross. Some of the material here is essentially repeated from that first set. In those cases I’ll basically touch on them in the track by track here, but not go into great detail. This is a brief ambient introduction. A live version of this killer number is worth the price of admission by itself. I’ve always liked pretty much everything on the Starless and Bible Black album and to hear the slight differences and nuances that come from live performance is great. Dramatic modes from the previous jam herald us into “Exiles.” This is a powerful number that was also presented on the first set. For that reason I won’t go into too much detail here, but this is great piece of progressive rock that is quite ballad-like but includes enough dramatic rocking to please fusion fans. The instrumental movements here are incredibly inspired and poignant. This starts in gentle ways and grows gradually from there. It has a classical music meets folk ballad approach. It rises upward after a time into an almost hoe-down motif. They eventually pull it back down to the more sedate territory to take it out. This seemingly rises up from the number that preceded it. This wonderful piece of music is another repeat from the first set. It’s so strong even if they performances were nearly identical it wouldn’t matter, but with Crimson each song is given a new life on each individual night through the use of improvisation and interpretation. Here’s a song that’s not listed as an improv, but yet it’s one I’ve never heard before – and it seems to only have incarnations in live performance. This instrumental leads off in a heavy mode that is much in keeping with the mood of the Red album. They twist it out into a fast paced rock and roll number but still delivered with classic Crimsonoid quirks and twists. They turn it out into a soaring sort of hard edged Crimson space jam later on. The song really feels like it could have come straight off of the Red disc. It becomes quite the jam before settling back into the song proper, working through a number of alternating progressions. The vocal section is different this time and eventually takes it out. Once again, we get another version of my all-time favorite King Crimson song. I couldn’t care less if the whole disc was nothing but one version of “Starless” after another. I like it that much. This is another killer version, but perhaps the one on the first set is a bit better. It’s certainly a close call, though. This improvisational piece focuses on the ambient, playful modes in a sedate way. They shift this out to more typical Crimsonian jamming, feeling a bit like something from Starless and Bible Black. It becomes quite the powerhouse in differing ways at different times as King Crimson present alternating patterns of rock versus more mellow motifs. The back cover of the first set listed this track as one that was supposed to appear on CD 1 of the set. It did not appear there, but we get a version here. Roughly the first half of this is a percussion solo. It fires out into faster paced rocking elements after a while. I love how the bass guitar drives parts of it. They get into a major groove at points on this one. Here is another track that gets several treatments throughout the four discs of this whole set. This is a roughly two and a half minute version. Let’s talk about truth in advertising. The title here is exactly what the song is. While I don’t have a problem with putting stuff like this on a life album, I question the rationale behind giving it its own track and title. At least they made it clear what we were getting. Improv - Is There Life Out There? At almost fifteen minutes in length, this is one of the lengthiest tracks on the set. Of course the last couple minutes are essentially part two of the previous piece. This starts with percussion and then the bass joins. Soon the whole band enter to take us on this adventure. It takes on elements of jazz structures at times here and really wanders close to fusion territory. They power out after a while. Then it shifts even further into jazz realms. King Crimson take us through a number of differing thematic excursions in this faster paced motif and then slow it down at around the six and a half minute mark. It eventually wanders towards ambience from there. This feels kind of dark and menacing at times. It threatens to rise back up at around the seven minute mark. Eventually the pounding grows and we get closer and closer to exploding back out into harder rocking territory. The shift comes gradually in the form of short bursts of sound. It never really transforms, though. Instead they shift it way down again to far more mellow territory. This just powers out in frantic, hard edged Crimson fireworks. It’s a killer jam. It turns rather funky at times and purely screams out at other points. They shift it down to mellower territory and then crank back out into the crunch. We also get a rather odd little journey that’s more stripped down with jabs of sound coming over a stumbling sort of bass line. It makes its way out to ambience to end. Here we have another version of the killer track from Starless and Bible Black. It’s a great version that holds up to any other rendition of the track I’ve known to exist. Here’s another repeat, and once again it’s a great version. We get some cool variations on this rendition. We also get some incredible bass work here. This begins in mellow, classical ways. These gentle, organic modes hold the track for the first couple minutes, but then it shifts towards more dangerous sounding elements. It turns for more dark and evil sounding as they carry on, feeling like music from some horror film soundtrack. Then after a while in this manner, turning rather noisy, they turn it out to a more rock oriented jam. The final transformation is to a noisy sort of Celtic music that finally ends it. This is a 53 second long ambient introduction. Here we have two and a half minutes of classic King Crimson improvisation. It’s noisy and quite cool. Rising from the ashes of the last improvised piece, this hard Crimson rocker is once again delivered with class and verve. It’s another strong rendition. This starts quite tentatively with odd pieces of sharp sound cutting through the ambient base. It rises up in a jarring, disquieting way, but still quite tentatively – in pieces. They eventually bring this up into a fairly classic Crimson jam. It’s noisy at times, stirring at times, but always interesting. It drops back to some sounds that remind me of the soundtrack to the film “Reanimator” to pull end. The final appearance of this rocker, the instrumental portion on this might be the best of the whole set. It’s got a great groove and includes some choice musical passages. This is an ambient sort of jam that is strangely pretty. It threatens to pound out into real rock, but never does. They turn it out into major weirdness later. Here we get another rendition of “The Talking Drum” to close things out. It’s a strong performance and a great piece of music to end on a high note.